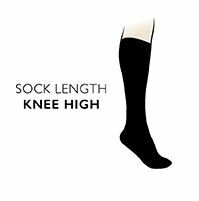 The ultimate in sophistication and style, these superfine, luxury knee high socks should be in every man's wardrobe. Smart, plain and elegant, they are made from 97% Cotton for the best in luxury and comfort. Your feet will stay exceptionally fresh and cool as the yarns absorbs moisture and wicks it away from the skin, while the hand linked toes for smooth seams prevent uncomfortable bunching or rubbing.